"Life after death for the lost." Life after death for the lost. The dead arrive in Gehenna as human beings, but if you stick around too long, as in don’t repent and get redeemed or simply die the second and final death, then you slowly turn into a demon—a vampire—and then you really do belong in hell. Michael Thane was just shy of scoring a millennia and the changes in his body and mind were now impossible to hide. Elizabeth Grant ended her life in a car crash. One of the things that had shocked her about Gehenna when she’d first arrived was how technologically advanced it was. When she’d pictured Purgatory, she’d thought of Pilgrim’s Progress, not Star Wars. Actually, no, that was wrong. Star Wars was too clean. Gehenna is more Firefly-esque. Old and new were butted up together without thought to continuity. Neither knew of the supernatural storm brewing with them at the centre, including murder and an all-or-nothing hunt through the worst parts of hell. A wrong step could mean annihilation and nothing is what it seems. Angels, demons and humans will all have to choose a side in a race for the chance at redemption. Gehenna has not been tagged yet. 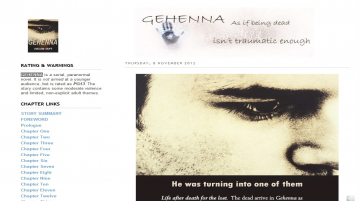 Help others find Gehenna by tagging it! Gehenna has not been reviewed yet. Gehenna has not been recommended yet.